Match ends, Bristol Rovers 5, Northampton Town 0. Second Half ends, Bristol Rovers 5, Northampton Town 0. Corner, Northampton Town. Conceded by Jermaine Easter. Attempt missed. Ollie Clarke (Bristol Rovers) right footed shot from outside the box is close, but misses to the right. Corner, Bristol Rovers. Conceded by Matthew Taylor. Attempt missed. James Clarke (Bristol Rovers) right footed shot from outside the box is just a bit too high. Attempt missed. Marc Richards (Northampton Town) left footed shot from the left side of the box is too high. Substitution, Bristol Rovers. Liam Lawrence replaces Billy Bodin. Attempt missed. Lee Brown (Bristol Rovers) left footed shot from outside the box is close, but misses to the right. Attempt saved. JJ Hooper (Northampton Town) header from the centre of the box is saved in the top centre of the goal. Sam Hoskins (Northampton Town) wins a free kick on the left wing. Attempt saved. JJ Hooper (Northampton Town) left footed shot from the centre of the box is saved in the centre of the goal. Substitution, Bristol Rovers. Byron Moore replaces Cristian Montaño. Hiram Boateng (Northampton Town) wins a free kick in the defensive half. Attempt saved. Tom Lockyer (Bristol Rovers) header from the centre of the box is saved in the top centre of the goal. Goal! 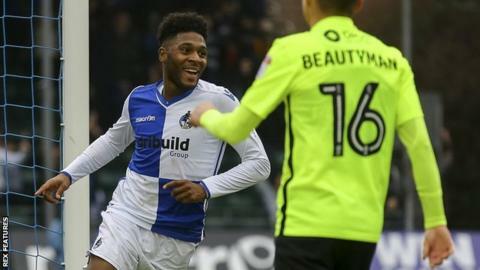 Bristol Rovers 5, Northampton Town 0. Ellis Harrison (Bristol Rovers) right footed shot from very close range to the top right corner. Assisted by Billy Bodin. Attempt missed. Chris Lines (Bristol Rovers) right footed shot from the centre of the box is close, but misses to the right. Second Half begins Bristol Rovers 4, Northampton Town 0.